Trim and roughly chop the leeks and courgettes and place in a large pan on a low heat with a lug of olive oil and the thyme leaves. Cook gently for 30 minutes, or until soft and lightly golden, with the lid on for the first 5 minutes, stirring regularly. Once soft and sweet, season to perfection and leave aside to cool for 5 to 10 minutes. Preheat the oven to 180°C/350°F/gas 4. Flake the salmon into the cooled mixture, crumble in the feta, grate over the zest from the lemon, crack in the eggs and stir well to combine. Layer the filo over the base of a lightly oiled ovenproof frying pan or dish (roughly 30cm), overlapping the sheets and letting them hang over the edge of the pan as you layer – make sure you fully cover the base and allow enough overhang to fully cover the filling once folded in – brushing with olive oil as you go. Spoon in the salmon filling, then fold in the overhanging filo to form a lid. Brush the top with olive oil and finely grate over the Parmesan. Bake on the bottom shelf of the oven for 45 to 50 minutes, or until cooked through, golden and crisp. Meanwhile, slice the lettuce and cucumber . Mix the juice from the lemon, the extra virgin olive oil and a pinch of salt and pepper together, then drizzle over the salad veg. 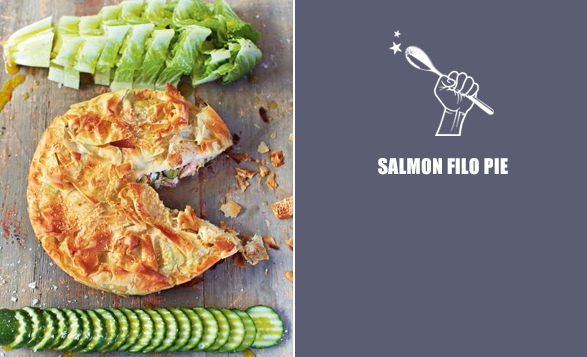 Transfer the filo pie to a board, cut into wedges, and serve. To make this pie extra cute, try tossing a few thyme sprigs in oil and scattering them over the filo before you bake it.